I began working in Warrington towards the end of the 1970s, and got extremely fond of the place. Returning from living in Wales for a number of years, I find the town very much changed. My wife also worked in Warrington, and I was reminiscing with her the other day about some stones I used to see. I never quite worked out what they were for, and I was hoping someone here with an interest in local history and bygones could enlighten me. I was aware of three of these stones, although there may be others I never discovered. One is at Lumb Brook beside the canal, and another is on the grass verge outside St. Oswald's Church in Winwick. I can't remember where the third one was. Looking at Google Street View, it seems the first two are still there. I'll be very grateful if anyone can remind me of the location of the other one. Anyway, these are rectangular blocks of red sandstone, with a flat top and a step at either end. They're about the right height to sit on. On the front is an inscription, with the lettering incised neatly into the stone, rather like on a gravestone. 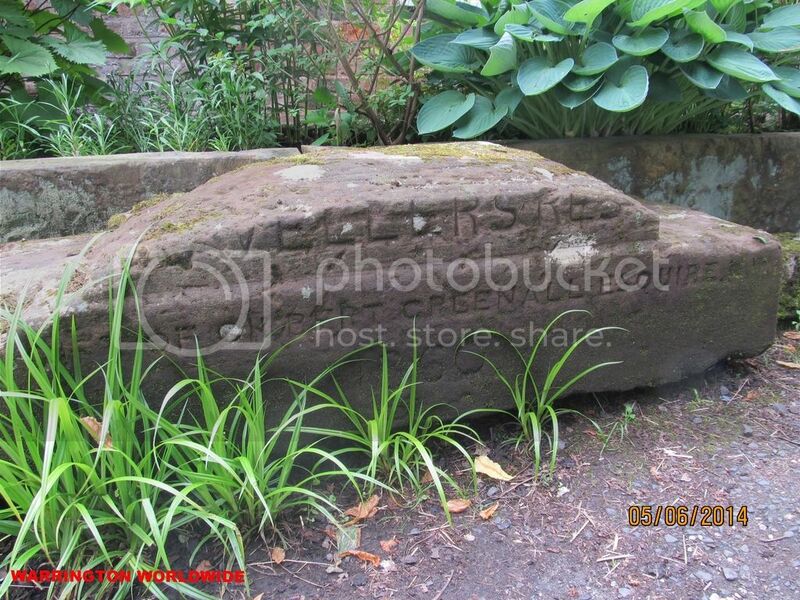 The main inscription says: "Traveller's Rest." Underneath, in smaller letters, is the legend: "Rest to the body is sweet, rest to the soul is sweeter." I originally assumed that these were simply provided for weary foot travellers to sit on to recover their strength. I'd guess they date from the 18th or 19th century. Later, I heard it suggested that they were intended to rest the coffin on, when funeral processions took place on foot over considerable distances. The steps would have facilitated lifting the coffin on and off, and this use would make sense of the inscription. Please, can anybody enlighten me about the purpose of these stones? I'll be greatly in your debt. Other than the two Travelers Rest stones you've already mentioned there is another one on the grassed area at the junction of Chester Road/Ellesmere Road/Walton Road (opposite the Stag Pub which is next to Chester Road Swing Bridge). There's also another one where you head up Grappenhall Road which then becomes the other Chester Road and it;s on the canal side of the road opposite Barrymore Road. but it would be interesting to find out if they actually were. Thanks for that information, and for sorting out my duplicate post. I'd forgotten about a couple of those stones, but then I haven't worked in Warrington since 1992. I'm sure there's another one somewhere, in really good condition with a nice crisp inscription. Maybe there are others further afield in the Cheshire countryside. There are two here in St. Helens, one in Victoria Park, and the other in Thatto Heath Park. The latter is very badly weathered. It was believed that the Victoria Park one was a mounting block from the large house in the park, which used to belong to a local 19th century solicitor called Ansdell. 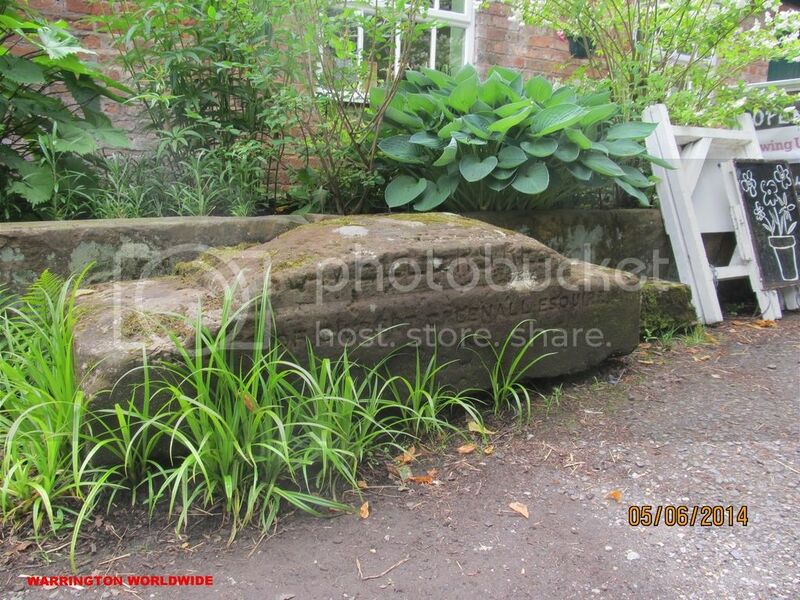 I actually wonder if it's high enough to be a useful mounting block. The coffin rest stone theory appeared in one of our local newspapers a number of years ago. I wonder if there are any local history books in Warrington which refer to these stones? I can't remember seeing anything about them in all the local history books I've got but I've got so many maybe I've just forgotten. There's another one which is quite high at the Walton Lea Walled Garden, the grounds of which were once Walton Lea House . I'll try and find my photo of it later as that has an inscription on it but isn't viewable from google maps. It's near the old stable blocks and houses so I'm guessing it's still in it's original position. Thanks for your help with this topic. If you get a few moments, it would be really interesting to see a photograph of the stone at Walton Lea. That was almost certainly a proper mounting block, and it would be useful to see how much taller it is than the ones dotted around the town. I just found my photos. 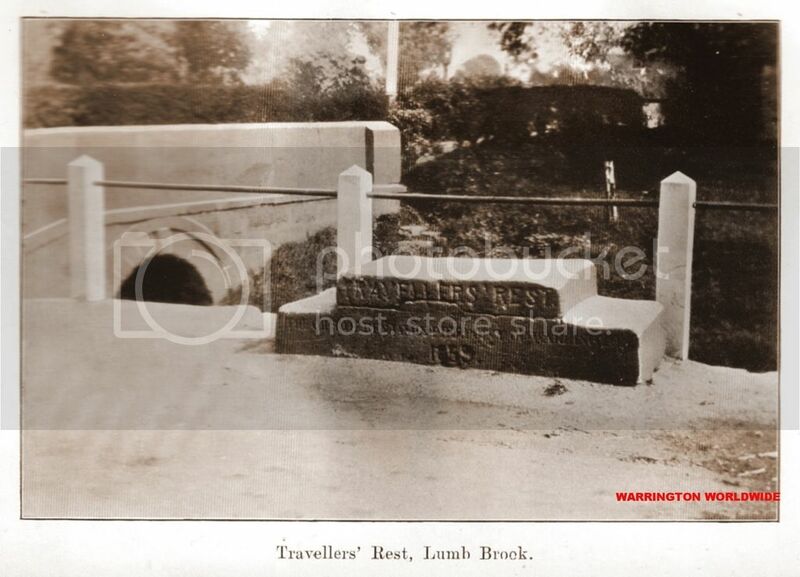 It says 'Travellers Rest of Gilbert Greenall Esquire, 1860' on it. Thinking about it though I doubt that was it's original position as the Walton Lea mansion and estate was built in 1864 (4 years after the date on the stone). Also it was built and owned by the Crosfield family and they and the Greenalls were political rivals and didn't get on. The Greenalls bought Walton Lea estate in 1926 and knocked the lovely large mansion down but they did retain the cottages, stables, lodge house (next to the main road) and also the walled garden. So my guess is that perhaps Gilbert G had his travellers rest moved there on or after that date (handy for him and his wife to get on and off their horses maybe) or someone else did. I'm sure I've still got a little paper booklet about the estate somewhere which I bought when I went there so I'll try and find it later and see if it's mentioned in it. Thanks for posting those photographs. I'm still puzzled by the designation Traveller's Rest, and even more so by how little information there is about these things on the internet. Incidentally, it occurred to me that it might be instructive to track down the origin of the sentiment inscribed on the stones I used to see around Warrington: "Rest to the body is sweet, rest to the soul is sweeter." I could not call it to mind as a direct quote from the scriptures. The nearest I can get to it is an excerpt from a sermon preached by one William Antliff D.D., a Primitive Methodist preacher who lived in England in the 19th century. His sermons were published and may have been circulated widely, and a number may still be found on the internet. This particular one was called The Good Old Way, and takes as its text Jeremiah 6:16. Towards the end of the sermon, he wrote: "And if rest of the body be sweet, sweeter still is rest for the soul." Possibly this sentiment became widely-known, and it's certainly very similar to the inscription on the stones. I wonder if Primitive Methodism was particularly strong as a movement in Warrington in the 19th century? I've no idea re religion and possible reasons for the wording sorry. Going back to your first post re the inscriptions the one near St Oswalds at Winwick saying 'Rest to the body is sweet, rest to the soul is sweeter' .. according to the photo and link below it actually says "Travelers Rest - Look Towards Thy Sanctuary Whilst I Am Here - 1860" and that certainly sounds like it has a religious meaning but maybe that was inscribed on that one it purely because it's next to the parish church. Interesting that the Gilbert Greenall one and the Winwick one both have the same date on them ie 1860. I wonder if the actual year has anything to do with them and why they were there ? .... date the toll roads opened or something to do with the turnpike trusts ??? Now you mention it, I don't know that I've ever examined the Winwick one at close quarters. I used to work on the district for British Gas, which gave me the opportunity to be out and about a good deal. I know I've seen the one just over the Walton swing bridge close up while I was on foot, so maybe that's the one with my original inscription, and I just assumed they all had that inscription. The one beside the canal at Lumb Brook, I've probably only ever seen while driving past, although I do seem to recall that it had had added to it, at some subsequent date, the broad arrow which I think is an Ordnance Survey bench mark. I may be wrong about that. I could do with cycling over some time when we have a nice day, so I could look at all these stones closely, and take some proper photographs. Incidentally, researching these stones has had a curious spin-off. I just spoke on the telephone to a former college lecturer who has a reputation as a local history expert. I was hoping he might know something about the stone, similar to the Warrington ones, in Victoria Park, St. Helens. He lives a short distance from the park. He wasn't able to tell me very much, but we got into conversation about his daughter, with whom I was friendly in the eighties. She moved with her husband and children to America, and I lost touch. It seems that she now lives in New Hampshire, is very active in politics, and has entertained two presidential candidates to breakfast in the last week. Quite a revelation, and all from researching some curious blocks of sandstone. I'll get on my bike in the coming week, take some pictures and report back. Thanks for all the help so far. placed there in memory of the Prince Consort, who died on the 14th December, 1861." "
They look like they were made in a similar style, at the same time. I wonder if it was some sort of civic or religious project?? Maybe the quotes even join up to make a longer passage? I'll keep looking, may not get to give it some proper thought til tomorrow though. Look what I found! Love that it was for breastfeeding mothers! Thank you so much for finding that. At least it dispels both the coffin rest theory and the mounting block one. I'll be in Warrington on Thursday, so I'll pop into the library and have a look at the microfiche reader. In Victorian times, I suppose nothing was too utilitarian to have some pious sentiment attached to it. I wonder if over time people did also started to use them to mount/dismount with them being along the roadside and 'stepped' or maybe people these days have just presumed that's what they were there for because of the shape and location. I feel a trip to the library coming on this week to see if I can find Kendricks letter to the Guardian... saying that looking through the Warrington Guardian's microfiches is an absolute nightmare but at least there is a good idea of a date for his letter. I wish the WG or the library would digitise them all or at least somehow index all the title contents to make it possible to do some sort of search on all the issues. 'The gift' I think. Ties in with the idea of benevolent gentlemen (like Gilbert Greenall) donating them. I'm no expert in matters horsey but I did think they don't look high enough to be mounting blocks. 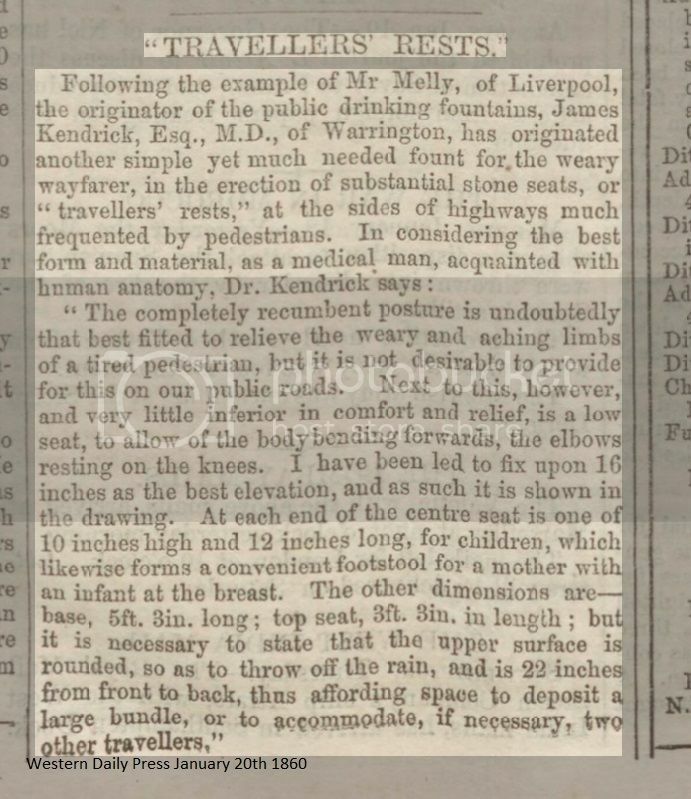 As an aside ,there is also an old drinking spring near the Legh Arms at Newton ,near the bus stops ,& apparently that road & the A49 from there to Warrington were the major route from the cotton mills of Bolton to Warrington & the south. I suppose in the times of improving communications Dizzy ,maybe the lives of prominent locals have been commemorated by the inscriptions on rest/mounting blocks. Could be so Davy51 and maybe Gilbert Greenall was involved or contributed to the cost of them all as he was renowned for doing things for the local community. 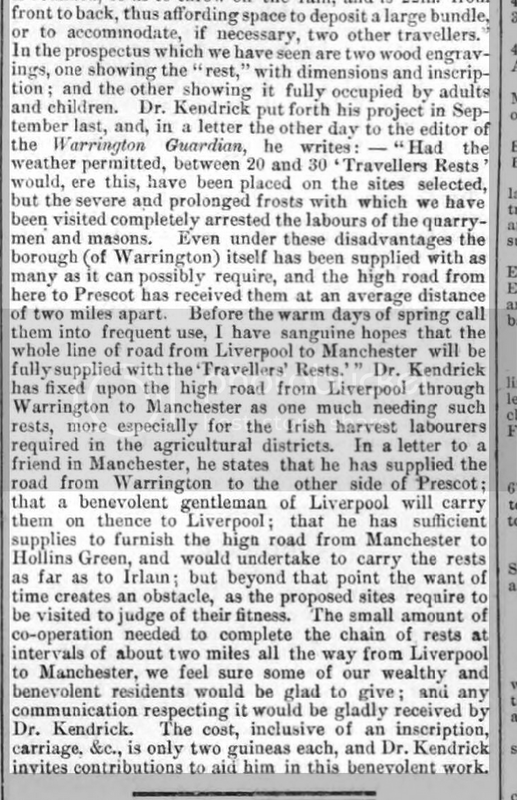 Maybe Benjamin Pierpoint did too and he was the mayor of Warrington in 1849-50. I wonder if all the sandstone was from the local quarry up at Appleton. Interesting re the A49 being the main cotton mill route and I didn't know that. The spring is located in the sandstone retaining wall near to the second bus stop from the Legh Arms opposite the lake. There is even a small trough so it is for horses too & any other livestock. I don't know what the source of water is but considering it is at the bottom of a large steep bank maybe ground water is the source which may mean it would dry up in times of prolonged drought. There's a thread on the Newton Le Willows site that has a lot of information about the spring on it. You have to be a member to see all the images but it's free to join. With respect I think you are over complicating the subject, mounting stones were exactly that, they enable riders especially those that were either short in stature, infirm or women wearing long riding skirts to mount their horses, many were inscribed with the persons name who donated them, they were usually placed at popular resting places for weary riders such as Inns or cross roads where riders dismounted, stretched their legs and then needed to remount their steeds. They were made of the cheapest material at hand which in this area was sandstone and had two or three steps.